1:15,000 scale model of Mt. Iglit Baco National Park, Mindoro Oriental and Occidental, Philippines (Yr 2002). 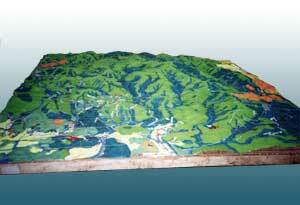 The 3D model covers a total area of 2,025 km2 and includes portions of two Ancestral Domains. 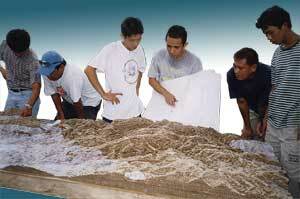 after its construction the 3-D model was located at the Protected Area office in San Jose, Occidental Mindoro. It has been used for planning purposes during Protected Area Management Board’s meetings, for awareness raising, introducing visitors to the area, and for discussing resource use and access during planning workshops. The mountain slopes of the Island of Mindoro are populated by Iraya, Alangan, Tadyawan, Tau-buid, Bangon, Buhid, Hanunoo and Ratagnon Indigenour People. All are distinctively different including their languages and “Mangyan” is just the collective term used for identifying the indigenous peoples found on the island. The Mts. Iglit-Baco National Park (MIBNP) was proclaimed by virtue R.A. No. 6148 dated Nov. 11, 1970. As such, it is an initial components of National Integrated Protected Areas System under. Mts. Iglit-Baco NP encompasses at least eight (8) major river systems and has a rugged terrain composed of slopes, river gorgers and plateaus. Portions of the Park are covered by upland hardwoods, such as Anthocephalus chinensis, Artocarpus blancoi, Ficus nota, Hawili, Alibangbang and Balinghasai. The larger plants indigenous to the site which are rarely seen in some other regions are Kalantas tree, Tindalo, Almaciga and Kamagong. The Park also harbors the endangered Jade vine. The Park is the habitat of the endemic Tamaraw (Bubalus mindorensis), which is one of the most seriously endangered large mammals. Because of the endangered Tamaraw, the Park was initially established as “game refuge and bird sanctuary”. The Park has been declared as an ASEAN Heritage site. Other forms of wildlife can also be found in the Park like the Phil. Deer, Wild Pig and Mindoro Cloud Rat as well as a number of bird species which are endemic to the island such as Mindoro Imperial Pigeon, Mindoro Scops Owl, Black-hooped Coucal, Scarlet-collared Flowerpecker and Heart Pigeon. Mount Iglit-Baco National Park covers large areas of the central part of the island of Mindoro on the Philippines. It is situated near Mt. Baco (2,488 m a.s.l.) and Mt. Iglit, the latter reaching 2,364 m a.s.l. Unfortunately, the island is among the most deforested parts of the archipelago. Less than 3% of primary forests have been preserved there. Remnants of lowland rain, mountain and cloud forests with critically threatened endemic animal species are protected in the national park.